A very cool and creative campaign by the Philadelphia Zoo to raise awareness. Nicely done. With the precarious state of ecosystems throughout the world today, it is difficult to know for certain which threatened species will continue to be around for future generations–and which will have gone the way of the Dodo. But as sobering of a legacy that may be, it is increasingly important to raise awareness of these fading animals early and often to the children of today, whose attitudes and actions as adults may determine the fate of the planet’s biodiversity. 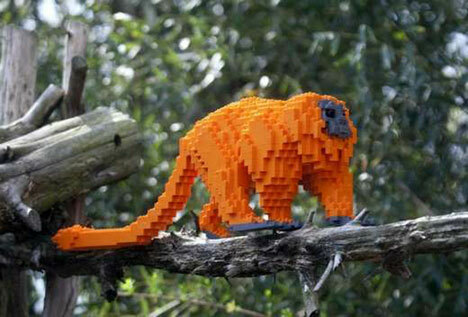 So, with that in mind, one zoo is educating its young visitors about the importance of preservation in an imaginative way–with an exhibition of endangered animals constructed out of Legos. 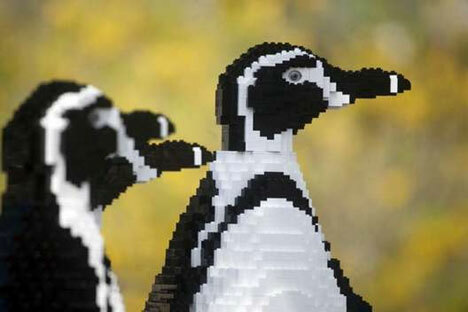 Opened yesterday, the Philadelphia Zoo‘s Lego-made exhibit, called ”Creatures of Habitat: A Gazillion-Piece Animal Adventure,” features the work of world-renowned Lego artist Sean Kenney. According to Kenney, the 34 animals he created for the zoo took him over one year to complete–the largest project he’s undertaken. 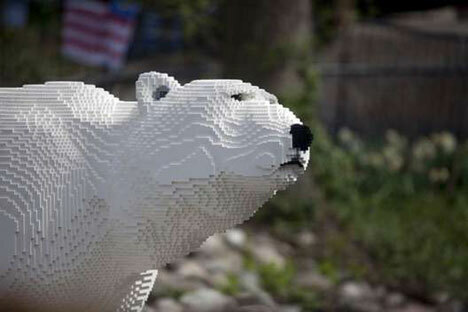 Included in the exhibit are sculptures of endangered birds, frogs, tamarins, and a polar bear made with 95,000 Lego pieces. “I love being able to explain serious problems in ways that kids can understand them,” says Kenney. In addition to the Lego sculptures, each exhibit features a description of how the animals’ habitat is under threat, and simple ways that everyone can help aid in its protection. Visitors are encouraged to recycle, avoid environmentally irresponsible products, and bicycle instead of drive when they can. Zoo officials are hoping that folks who may have been drawn in by the impressive sculptures will walk away with a better understanding of threatened ecosystems and what they can do to lower their impact. GM is Not Made up of All Old White Men, Afterall.